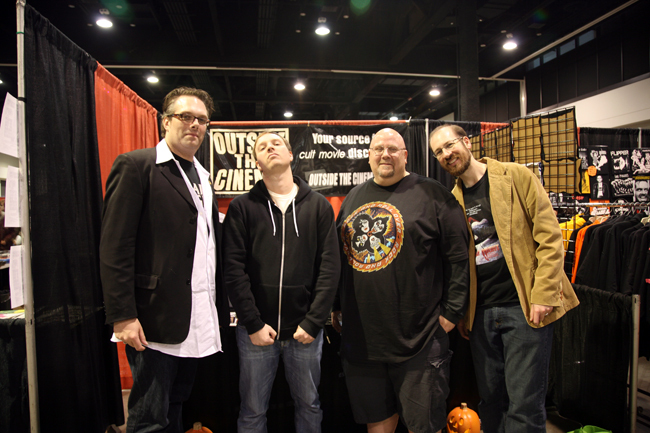 This past weekend, we attended Rock and Shock in Worcester, MA. 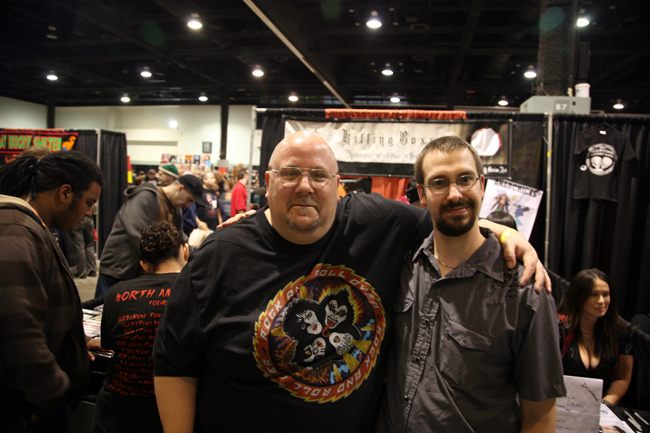 Rock and Shock is a unique blend of a horror convention and heavy metal shows, and it's always a great time. We screened the first six episodes of our new project Infinite Santa 8000 on Friday and throughout the weekend, and on Sunday we gave a seminar on making your own live-action or animated film. They both went well, and thanks to everyone who came out to them! 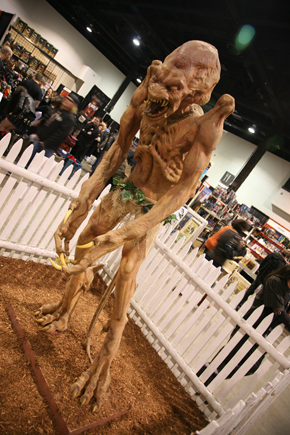 Pumpkinhead never misses a horror con. 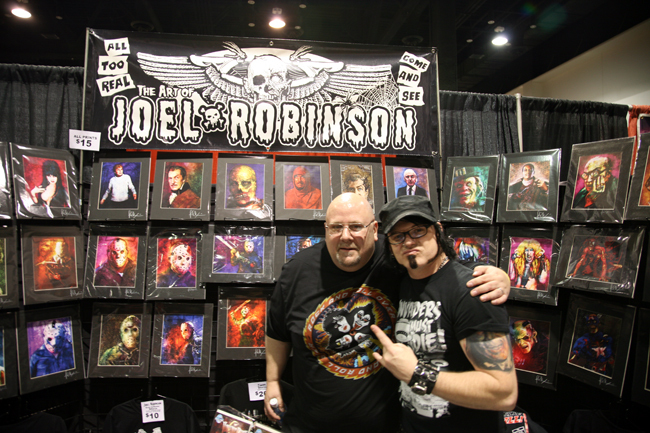 There were a lot of great celebrities, including Doug Bradley (Pinhead from Hellraiser), Danny Trejo (Machete), and the Grandfather of Zombie Cinema George Romero (creator of Night of the Living Dead). 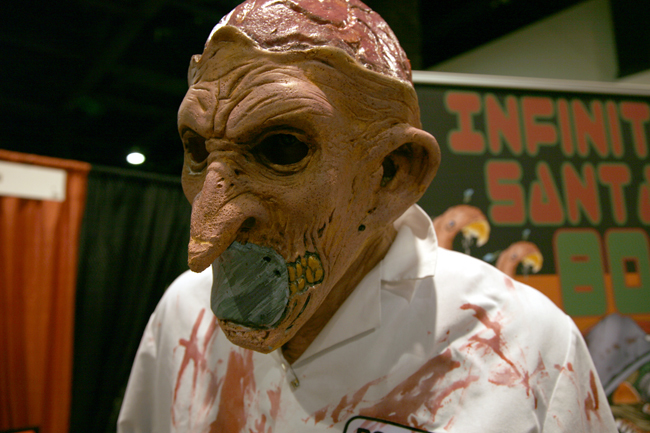 We walked with Duane Bruce (the voice of Infinite Santa) around the convention floor, checking out the horrific sights and sounds. We ran into some familiar faces and made some new friends as well. 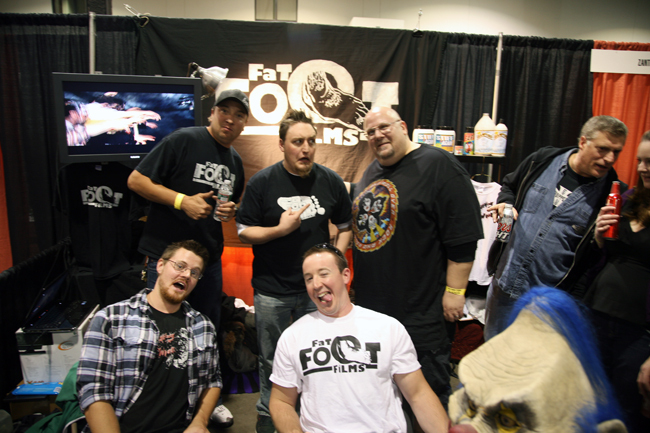 We hung out with the creepy folks at Fat Foot Films. 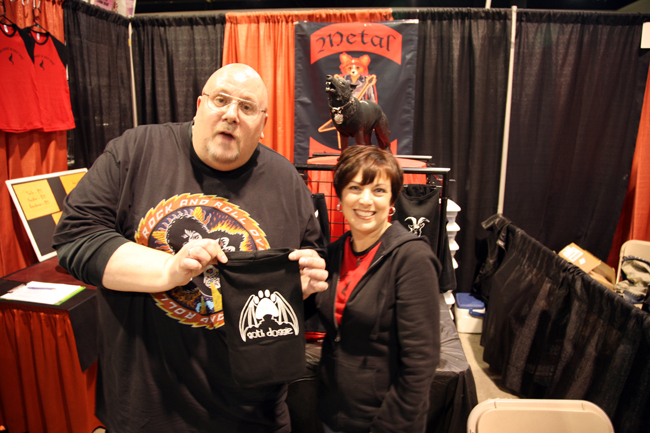 Then we stopped by Metal Dogz to dress our undead pup in the finest goth doggie wear. Jason Logan at Lethal Wear showed us his custom leather gear. 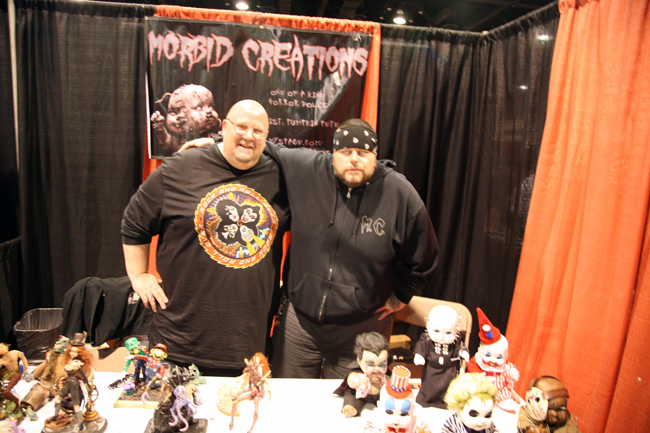 Morbid Creations were selling a zombie Super Mario and baby John Wayne Gacy. Cute...and creepy. 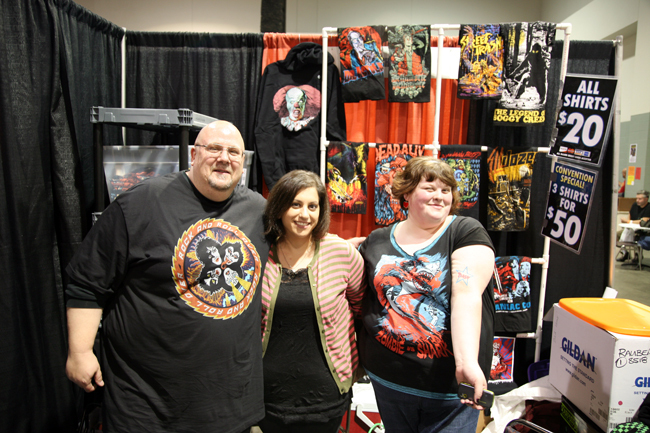 Kristy Jett showed off her Clash tattoo at the Fright Rags booth. Zombie vs. Shark is a classic tee. Mr. Chris (left) and Bill from Outside the Cinema made us feel at home. Well, Mr. Chris did. Bill just looked creepy. Ken from KillingBoxx made us feel right at home. Thanks to everyone who visited us! 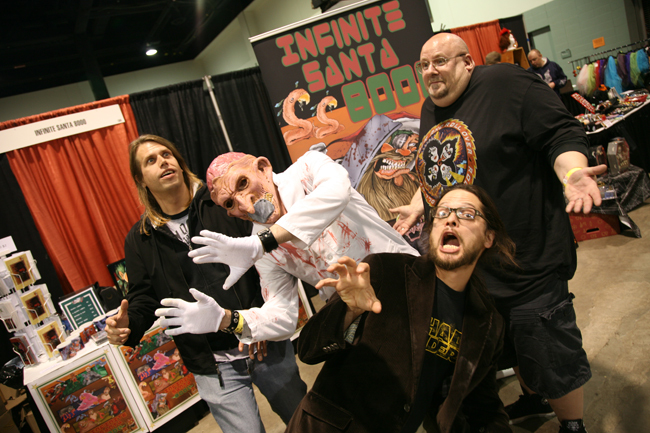 Don't forget to tune in every week to Infinite Santa 8000. We're releasing a new webisode every week until Christmas. And we have horrific Christmas merch on sale as well!